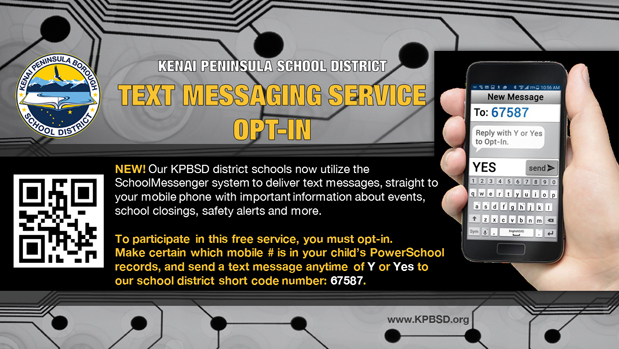 The Kenai Peninsula Borough School District can now utilize the SchoolMessenger system to deliver text messages, straight to a parent, guardian, or student mobile phone with important information about events, school closings, safety alerts and more. When you enroll or update your mobile contact in PowerSchool you will receive a positive opt-in text. To activate the free Text Messaging Service, a positive opt-in is necessary from your mobile phone. Parents, guardians, and students can participate in this free service by sending a text message of "Y" or "Yes" to our school district's short code number, 67587, and making certain that your cellular contact is correct in PowerSchool. Do you have a cell phone registered in the KPBSD PowerSchool contact information? NO? Contact the office at your child's school to update PowerSchool with your preferred mobile phone contact in order to activate SMS text messages and alerts. Each student contact may include three numbers to receive SMS texts: two adult contacts, and the student SMS contact (if applicable). YES? You will receive a legitimate (it's not spam) text from 67587 that begins with, "Kenai Peninsula Borough School District alerts." The text invites you to positively OPT-IN to receive future messages from your child's school, or the main school district office. If your cellular number is activated in PowerSchool after May 17, you will receive the positive opt-in text within 24 hours. You can positively opt-in at any time. The contact information for parents, guardians, and students is sourced from contact information in PowerSchool. To update or review your information in PowerSchool, contact your school secretary, go to PowerSchool via your computer, the PowerSchool app, or the Kenai Peninsula SD mobile app. In ongoing efforts to increase campus safety and communication, the school district added SMS alert functionality to our existing communication alert system (School Messenger). For specific questions about safety protocols, please talk to your school principal.